DETROIT – United Auto Workers International Vice-President Cindy Estrada has called on union members to mobilize to create “foreclosure-free zones,” to halt the eviction threats that have affected more than 16,000 families in southeastern Michigan since 2008. Addressing a “People’s Hearing” attended by more than 150 Detroit-area residents May 20, Estrada and two dozen homeowners, neighborhood leaders, and legal workers shared their experiences in facing down the attempts by banks, mortgage holders, and the federal-backed mortgage agencies Fannie Mae and Freddie Mac to kick people out of their homes. Northwest Detroit resident Jerry Cullors testified how he and his wife awoke on Halloween last fall to see a dumpster and wrecking crew outside their home. Anti-eviction fighters from the UAW, the Detroit Eviction Defense group, and others quickly filled the dumpster with fallen leaves, leaving no room for the family’s possessions. At the same time, legal workers were in court to win a stay of the eviction. While Cullors and some other threatened residents have been able to stay in their homes thanks to community supporters blocking dumpsters, and legal efforts seeking stays of evictions, thousands of others are facing the imminent loss of their homes. Ted Phillips of Detroit’s United Community Housing Coalition testified that Fannie Mae and Freddie Mac have made 3,203 requests for bailiffs to evict families in Wayne County’s 36th District Court alone. Victims of foreclosures often are families who have suffered unemployment or medical problems and who have asked for loan modifications or reductions in principal. But, as many homeowners and community leaders testified, more often than not, banks will deny or stall such requests and then, without proper warning, will foreclose on the homes and put them up for sale at sheriff’s auctions. Once homes are foreclosed and sold at a sheriff’s auction and families are evicted, one of two things happen, Phillips said. The houses sit vacant, adding to neighborhood blight, or are sold for bargain-basement prices to outside investors who often “flip” them to sell at market rates. Even if the occupants of the foreclosed homes offer to buy them back at market prices to avoid eviction, Fannie Mae and Freddie Mac will not deal with them. Representatives of Fannie Mae and Freddie Mac had promised to attend the hearing. But at the last minute, they refused to come, and two vacant chairs labeled with the agencies’ names faced the audience. Detroit attorney Jerry Goldberg reminded the audience that during the Great Depression of the 1930s, Michigan had a law providing a five-year moratorium against foreclosures. “We need such a law again in Michigan and across the country,” he said. Hanging in front of the union hall was a banner urging President Obama to issue an executive order for a two-year moratorium on foreclosures and evictions. Organizers of the hearing distributed a publication, “A Hurricane Without Water,” that points out the federal government halted foreclosure and reduced mortgage principal for victims of Hurricane Sandy. Organizers said they would send a videotape of the hearings to Fannie Mae and Freddie Mac so they could see and hear the testimony that they refused to hear in person, and that they would plan demonstrations at the agencies’ headquarters. Detroit Eviction Defense meets every Thursday. Further information is available at www.DetroitEvictionDefense.org. 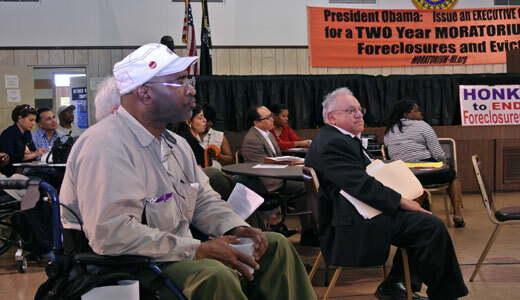 Photo: “People’s Hearing” on foreclosures, May 20 in Detroit. At right is attorney Jerry Goldberg. 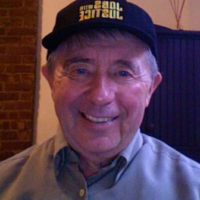 Photo courtesy of Bob Ingalls.